Hanwei Hanger Black Finish(OH2377) Samurai sword maintenance toolkits, katana maintenance toolkits. Our steel sword hangers provide an economical and sturdy solution for displaying any Japanese-style or medieval sword on a wall. 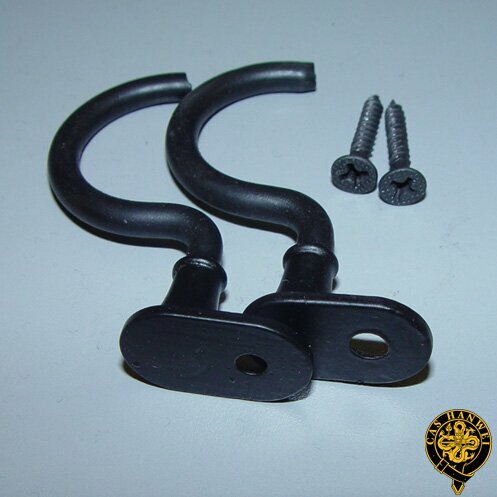 Supplied in pairs in either nickel plated (0H2378) or black powder-coated (OH2377)finish, the hangers can be arranged to display the sword either horizontally or at an angle and are supplied with mounting screws (wall-board or sheet-rock mounting will also require wall anchors). Both styles have plastic-covered hooks, to avoid damage to Saya finishes. Simple and unobtrusive, these hangers are designed to focus attention on the piece being displayed.